Today we are open sourcing a new library for building HTML documents in Swift. It’s extensible, transformable, type-safe, and provides many benefits over templating languages. The entire Point-Free website is built using server-side Swift, and the code base has been open source from day one. When we set out to build the site we wanted to rethink a lot of industry best practices when it came to how to build a web framework, and we started with the view layer. So, today we are excited to announce an official release of swift-html, an HTML library written in Swift and perfect for building HTML views for websites that are powered by Swift. The current best practice for rendering HTML views is to use templating languages. Some popular examples are Stencil, Mustache, Handlebars, and Leaf. These are languages that are embedded in a plain text document and provide various tokens for interpolating values into the document, and some basic logical and looping constructs. You can think of it as a fancier version of Swift’s multi-line string literals with interpolations, e.g. "Hello \(name)". Templating languages are always stringly typed because you provide your template as a big ole string, and then at runtime the values are interpolated and logic is executed. This means things we take for granted in Swift, like the compiler catching typos and type mismatches, will go unnoticed until you run the code. Templating languages are just that: programming languages. That means you should expect from these languages all of the niceties you get from other fully-fledged languages like Swift. That includes syntax highlighting, IDE autocompletion, static analysis, refactoring tools, breakpoints, debugger, and a whole slew of features that make Swift powerful like let-bindings, conditionals, loops and more. However, the reality is that no templating language supports all of these features. Templating languages are rigid in that they do not allow the types of compositions and transformations we are used to performing on data structures in Swift. It is not possible to succinctly traverse over the documents you build, and inspect or transform the nodes you visit. This capability has many applications, such as being able to pretty print or minify your HTML output, or writing a transformation that allows you to inline a CSS stylesheet into an HTML node. There are entire worlds closed off to you due to how templating languages work. Now that we understand why we are searching for a better solution to HTML views than what templating languages can offer us, what is the solution? The solution is to use Swift, not a whole new programming language! "Functional programming in Swift. ", a([href("/about")], ["Learn more"]), "!" And this looks pretty similar to how the HTML would look if coded by hand. You will notice that this string isn’t formatted in a particularly nice way. However, it’s valid HTML and is in its minimal form so takes up the least number of bytes. It’s possible to create additional interpreters of this DSL for pretty printing, and even markdown or plain text printing, but we’ll release that soon in another library. Because we are embedding our DSL in Swift we can take advantage of some advanced Swift features to add an extra layer of safety when constructing HTML documents. For a simple example, we can strengthen many HTML APIs to force their true types rather than just relying on strings. Here the src attribute takes a string, but the width and height attributes take integers as it is invalid to put anything else in those attributes. Since we are modeling HTML as a DSL with simple Swift data types, it is very easy to do fun transformations on documents. To cook up a function (Node) -> Node you just have to switch over the input node and handle the various cases of the enum. Doing so leads you into recursively traversing the entire document and enabling you to transform any part of the DOM tree. // First a helper function to redacting a raw string. // and raw text nodes in a Node. It is absolutely striking that we were able to perform such a high level transformation in so few lines of code, and better yet the code is very straightforward and readable. And these kinds of transformations are not possible at all with templating languages. Instead, you have to bring in another dependency that can parse your HTML into a data structure so that you can perform the transformation and then re-render it back out to a string. It may seem surprising, but it’s actually quite popular for people to that kind of round trip parsing and printing in practice. 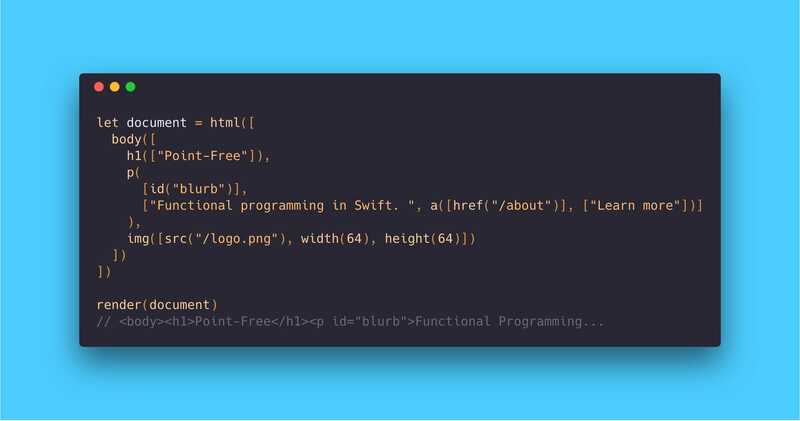 The DSL style of modeling HTML in Swift is very powerful, and has many advantages over the traditional style of templating languages. In this article we have demonstrated numerous wonderful things the DSL can accomplish, and how it can add safety and expressivity to HTML views built in Swift. However, this is only the beginning. There is still so much more to say about the Node type. We’ll have to save that for another time, but until then please check out swift-html, our brand new open source library for building HTML in Swift.